Top model. We review the high-end SKU of Microsoft's luxury 2-in-1 with a fast 1 TB NVMe-SSD and 16 GB DDR4 of RAM. We check the differences to the entry-level version from 2017 that we have already reviewed. You currently pay a hefty premium of $1100 ($3199; base model $2099) for an additional 768 GB of SSD storage and 8 GB of RAM extra. This is a lot, but not unusual for high-end SKUs with a limited user interest. We will check the performance difference compared to the entry-level version. A comprehensive review for the 256 GB model with measurements for the display as well as the fan noise, speakers, keyboard, and many more, is available here. Our test model from Microsoft Austria is equipped with an M.2 SSD from Samsung. 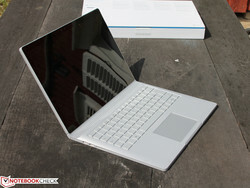 It has the designation MZFLW1T0 with a storage capacity of 1 TB. It uses the NVMe protocol just like the 256 GB model in the entry-level and has a similar problem with the write operations in the AS SSD benchmark. CrystalDiskMark on the other hand shows similar performance figures to the entry-level model. However, the Samsung MZFLW1T0 cannot keep up with fast M.2 NVMe desktop SSDs. 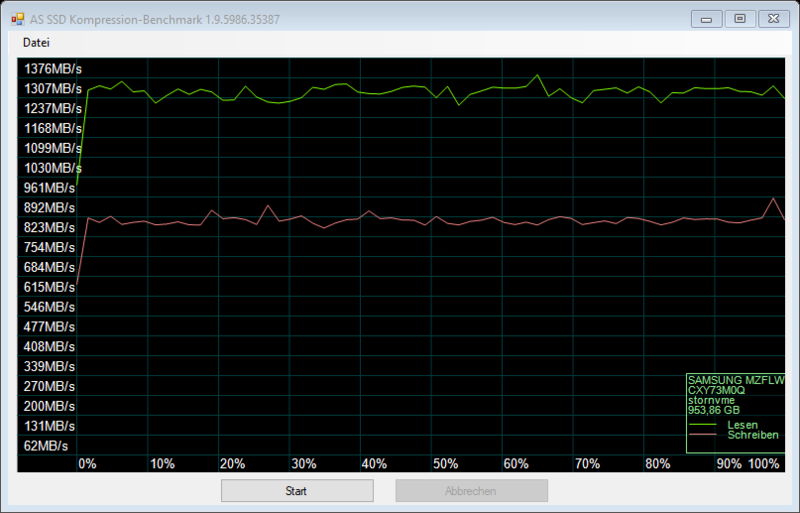 Even 950 Pro as well as 960 Pro are about 66% faster in CrystalDiskMark (e.g. Schenker XMG U727). The Samsung is also just behind the 1 TB SSD in the 2016 MacBook Pro models; but is much faster in the important 4K tests in return. 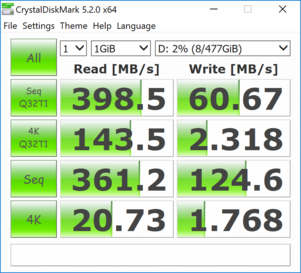 Unfortunately, we do not have any results in AS SSD's copy benchmark for the 256 GB version, but we can see a big deficit compared to the faster 960 M.2-SSDs. The MacBook Pro 15 is also much faster in the ISO copy test (the only one that worked). The PCMark 8 Storage Test simulates typical load scenarios. The performance is a bit better than the 256 GB model (-1%) and just behind the Apple SSD inside the MBP 15 (+1%). The second upgrade is the RAM equipment with a total of 16 GB. The combination with the SSD should also influence the application performance of the Surface Book. The Cinebench results are a bit surprising. The single-core performance is, as expected, on par, but the 256 GB model is 4% faster in the multi-core test. This should be a result of usual variances within the series as well as the cooling (maybe bad thermal paste application). The lower multi-core performance should also affect the PCMark 8 performance, but the 16 GB model can still beat the 8 GB entry-level system. Both systems are on par in the Work test, while the 256 GB model is 18% slower in the Creative test. The top model of the Surface Book with Performance Base offers more storage capacity and twice as much RAM compared to the entry-level model. The performance of the SSD is on par with the base 256 GB model from Toshiba, so no gains in this respect. We can, however, notice the upgrade to 16 GB RAM in two out of three PCMark 8 tests. Still, this does not justify the hefty additional price of $1100. You should only get the high-end SKU if you really need 1 TB of storage capacity. 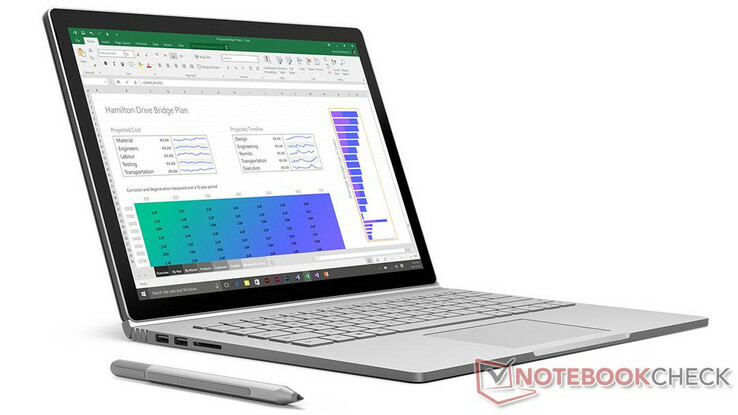 Please see our in-depth review for more information about the Microsoft Surface Book.